SAP-Centric Financials is next week!. 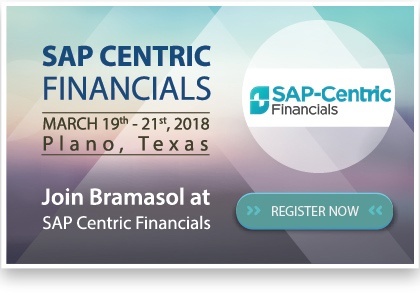 Plan to join Bramasol at Booth #8 and learn the latest about our technology innovations and solutions for challenges facing the Office of the CFO. Wednesday, March 21 from 8:30 a.m. to 12:30 p.m.
2018 is a monumental year for compliance changes and you must be ready. The SEC, AICPA, PCAOB and FASB are all putting increased scrutiny on how your company will comply with the new Revenue Accounting (ASC 606/IFRS 15) and Leasing (ASC 842/IFRS 16) standards. For public companies the time is past to comply with ASC 606 and Leasing is less than 10 months away – how will you get there? Can you take advantage of what others have learned? What are the best practices to facilitate success. Tips, Tricks and Advice on not just complying, but having a successful RevRec and/or Leasing project. Bramasol will also be co-sponsoring these SAP User Group Meetings during SAP Centric Financials. Sign up by clicking on the registration links below.